Foossa designs conversations and experiences that deepen understanding, strengthen community, and spark action. These conversations and experiences can last anywhere from 20 minutes to 20 months or more, and take place in the context of a panel discussion, an intensive workshop, an intimate shared meal, a series of public engagement events, or in the broader popular culture and media landscape. Our aim is to create experiences that are immersive and transformative, and in order to do so, we draw from our interdisciplinary experience in design, storytelling, cognitive neuroscience, community organizing, and the performing arts. Rather than “safe spaces,” we foster “brave spaces,” where participants can take risks that challenge orthodoxy and encourage innovation. We create “magic circles” where almost anything seems possible and where even failure can feel like fun. We also help harness the collective intelligence of these conversations and scale them to the public sphere, to influence decision makers in business, public policy, and popular culture. We would love to start a conversation with you. Drop us a line at hello(at)foossa(dot)com or use our contact form. The following examples illustrate the breadth of our work, and we hope that they can serve as conversation starters about what we can do for you and your community. 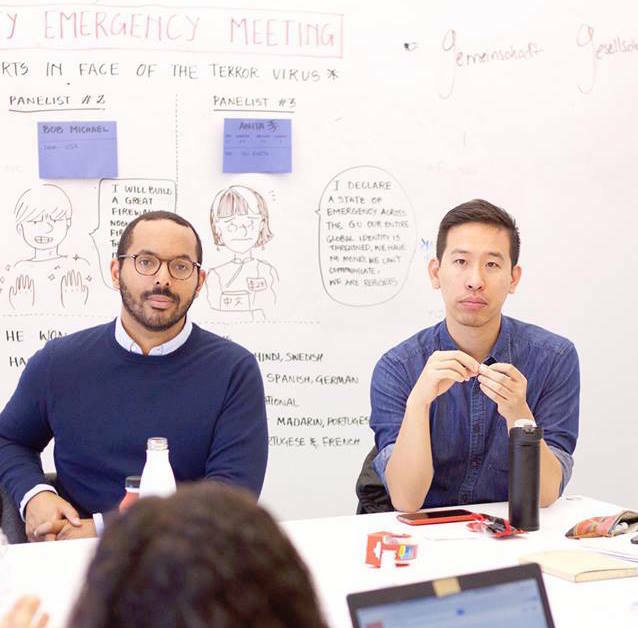 We collaborated with Google and the Center for Global Policy Solutions, a think- and do-tank, to convene and facilitate a diverse group of experts in conversations to forward concrete policy recommendations on algorithms, artificial intelligence, and social justice. We have designed and facilitated workshops with Fortune 500 brands to forward conversations about the future of retail and financial services. We advised a major online social network on the shifting meaning of friendship in our hyperconnected age. With authors Jeremy Heimans and Henry Timms, we facilitated conversations in-person and online about “new power” in business, culture, and politics. We worked with UX for Good and Rwandan genocide survivors at the Kigali Genocide Memorial to redesign parts of the visitor experience. We helped broaden the conversation from remembrance and truth telling to include prompts for visitors to take action on contemporary humanitarian issues. We designed a new system for diplomats at the United Nations to manage knowledge and share stories about ways to negotiate peaceful resolutions to conflict. We helped another UN agency craft new ways to tell their stories to engage donors and the general public on their life-changing work empowering independent farmers in developing countries. In collaboration with Purpose, the Catalyst research consortium and the European Commission, we convened online conversations and debate on European identity and narrative to test new experimental tools for scaling civic participation. We helped an international human rights organization bring the conversation about expanding protections for children in conflict zones to schools and families around the world. We led leaders from a global real estate development and management company to in a process to help them find ways to incorporate innovation as a core capacity in their business.